Mark Hall, ATC, CSCS, and former Strength Coach Adam Lonon look to develop your athletes’ athleticism through a focus on body positioning, corrective movements, and proper running form and technique for speed performance. Our beginner program focuses on creating a foundation with basic coordination, agility, and speed techniques. “Beginner” Athletes will be challenged in a fun, structured environment aimed at learning and understanding age-appropriate exercises and movement correction methods. Our Novice/Advanced program looks to maximize the potential of each athlete preparing them for their sport season. The week will include a steady progression that looks to improve your child’s performance to compete at the next level. Items covered will be dynamic warm-up routines to prepare for activity, ACL injury prevention, acceleration, deceleration, and multi-directional speed. About Coach Lonon: Coach Lonon currently trains high school and college athletes where he creates sports specific performance programs. He was previously the Strength and Conditioning Coach at steward School where he was a certified strength and conditioning specialist (NSCA) and USAW-Level 1 certified. Coach Lonon is currently the Trinity Girls Basketball Head coach and attended College at Virginia Military Institute where he started 81 games for the men’s basketball team. 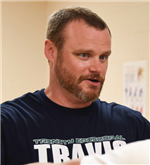 About Coach Hall: Coach Hall is a certified athletic trainer (NATA) and has been Trinity’s athletic trainer for the last four years. Previously Mark has served as Steward School’s athletic trainer and has been the director of sports performance for Explosive Performance and In Motion Physical Therapy. Mark is a certified strength and conditioning specialist (NSCA) and has been certified as an USAW level 1 coach and a functional movement specialist (FMS).